If you're finding it a bit easier to snag a table at your favorite restaurant lately, don't go crediting your debonair charm or your glowing Yelp review. Eateries really are less crowded these days. Retail tracker NPD Group is forecasting that dining activity won't pick up until the latter half of next year. After a marginal 0.2% uptick during this year's first quarter, restaurant traffic has suffered 0.4% declines through the second and third quarters. It's the economy, of course. 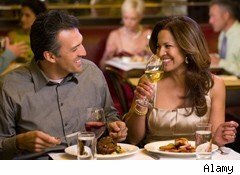 Pesky unemployment rates, high gas prices, and uncertain economic growth prospects make consumers less likely to splurge on a fancy outing. Even fast-food dollar menus can't compete with that cup of ramen noodles in your cupboard. If you wanted any confirmation of the problematic industry trend, Darden Restaurants' (DRI) preliminary quarterly report should set you straight. "When you're here, you're family," is Olive Garden's slogan. Well, Tuesday's earnings report makes Olive Garden parent Darden seem more like a broken home. Shares of Darden fell 12% after the company posted uninspiring preliminary fiscal second-quarter results and slashed its bottom-line growth target for the entire year. Darden now sees earnings climbing 4% to 7% in fiscal 2012, which ends in May, short of the 12% to 15% growth it was originally forecasting. Darden is a major player in casual dining. It runs the Olive Garden, Red Lobster, and LongHorn Steakhouse chains. It also watches over the smaller Capital Grille, Bahama Breeze, Seasons 52, and Eddie V's chains that largely aim for a slightly more affluent crowd. The problem spot for Darden right now is Olive Garden. Red Lobster and LongHorn held up well during the fiscal second quarter, but its Italian concept suffered a 2.5% dip in U.S. same-restaurant sales. Darden is responding to the shortfall at Olive Garden. It will push for new menu items across various price points. Darden will also work on a new marketing campaign that emphasizes the chain's value advantage over pricier Italian trattorias. Like a busboy juggling a tray full of plates, its challenge here is not to lose sight of the many moving parts as it tries to set things right. Dining out isn't going away. Flattish industry results suggest that there's a winner for every loser. Restaurant reservations specialist OpenTable (OPEN) saw a 42% spike in seated diners in its latest quarter, though a good chunk of that was the result of OpenTable growing its participating restaurants by 25% over the past year. And some chains will continue to prosper. Analysts see Chipotle Mexican Grill (CMG), for example, growing its profitability by 21% this year and accelerating to 26% growth next year. Investors may not necessarily want to wait until eatery traffic picks up a year from now. The key is to separate the winners from the losers. A little field research this weekend at your restaurant of choice may be more than a little overdue. Longtime Motley Fool contributor Rick Munarriz does not own shares in any stocks in this article. The Motley Fool owns shares of OpenTable, Chipotle Mexican Grill, and Darden Restaurants. Motley Fool newsletter services have recommended buying shares of Chipotle Mexican Grill and OpenTable.